Its name means Cape of Gold and it’s certainly one of Nova Scotia’s treasures. There’s been a lighthouse perched on these cliffs, over 100 meters high, since 1922. The current lighthouse dates from 1965 and while you can’t sleep inside, you can get a room or eat a meal in the lightkeepers cottage between May and October. There’s also a small interpretive centre. 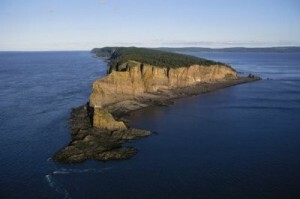 Cape d’Or is a great place for a hike or walk along the beach. If you’re lucky, you might catch a glimpse of a dolphin or seal. Looking out over the waves, on a good day you can see as far as the Annapolis Valley and Cape Split – the headland that separates the Bay of Fundy from the Minas Basin.